Dr. Huigen Yang was interviewed by Jean de Pomereu aboard the Xue Long as it sailed from Antarctica to Australia during the last week of December 2008. Born in Suzhou near Shanghai, Dr. Yang graduated from Wuhan University in 1991 with a PhD in Magnetospheric Physics. He then joined the newly founded Polar Research Institute of China (PRIC) in Shanghai, and in 1992-93 spent 17 months carrying out Aurora observations at Japan's Antarctic Syowa Station thanks to an ongoing collaboration between PRIC and the Japanese National Institute of Polar Research (NIPR). From 1998 to 2000, he completed a Post-Doctorate at NIPR in Tokyo, and in 2001, he was promoted to the post of Research Director at PRIC. A position he held until 2008, when he was made the Director General of PRIC. With the inland traverse team now on its way to Dome A, and the Xue Long sailing back to Australia to pick up more cargo for Zhongshan Station, could you give us your point of view on how the 25th Chinese National Antarctic Research Expedition has gone so far? In order to complete our heavy workload this year, CHINARE 25 started much earlier than previous Chinese National Antarctic Research Expeditions. And although we anticipated severe conditions because of our early arrival at Zhongshan Station, the sea ice and snow cover conditions we encountered were much worse than usual, even for this time of year. This prolonged our ice breaking operations considerably. What's more, we encountered as many as eight storms and blizzards in the first twenty days after reaching the fast-ice. This gave us very narrow windows of opportunity for helicopter and unloading operations. Because of these setbacks, we modified some of our unloading plans to prioritize our most important task: The building of Kunlun Station at Dome A. As a result, the construction team was able to depart as early as possible under the circumstances and is presently over 800 kilometres inland (or more than two-thirds of its way to Dome A). The leader of the expedition, Mr Li Yuansheng, and his team are very determined people, and I am now confident that they will overcome the difficulties to complete the first phase of construction of the station as planned. At Zhongshan Station, the building work is on track, but some of the construction material we should have unloaded is still onboard the Xue Long because of the delays we encountered. This means that at the end of January, we will need to unload this material plus extra cargo we are on our way to pick up in Melbourne. As a result, the second phase of unloading could also prove a challenge, and I hope that we will be able to complete it in time. Our IPY programme, PANDA, is now in its second of three years. Mr Li has three scientists with him on the Dome A team and they will carry out their planned glaciological, geophysical, meteorological and atmospheric work. In addition, the Chief Doctor will carry out a range of physiological and psychological tests on the members of the expedition. At Zhongshan Station, a team of 13 researchers are spending the summer season carrying out atmospheric, geophysical, and glaciological work in around the station, whilst 7 researchers will winter over to continue their research on the upper atmosphere, ozone, meteorology, sea ice, tide and gravity. Onboard Xue Long, 16 researchers are constantly at work conducting a whole range of physical, chemical, and biological oceanography measurements during our two return cruises from Australia to Antarctica. In February, the Xue Long will also carry out its annual grid survey of Prydz Bay so that our researchers can continue their ongoing monitoring work relating to marine biology and ocean-sea ice-atmosphere interaction in the region. The vessel will then cruise along the edge of the Amery ice shelf to study ice shelf-ocean interaction, and also to deploy a team on the shelf itself in order to install a grid of instruments for long term measurement of glacial flow and ice dynamics. In hindsight, what might have you organized differently, and what solutions are you considering to support Kunlun Station in the future? Thankfully, last year we tested a KA-32 cargo-lifting helicopter (leased from Korea) for our unloading, and on the back of that success, we also leased one for this year's operation. This proved to be the right solution for the severe conditions we encountered. Nothing would have been achieved without it. Of course, we also tried arriving much earlier than ever before, and that approach may need to be reconsidered. Looking to the future, we have just received approval for the purchase of our own KA-32 cargo lifting helicopter. But I also think that we need to improve our planning scheme and to better anticipate the kind of extraordinary conditions encountered this year. In this perspective, I am keen to establish a dedicated sea ice unit within PRIC. Looking longer term, I think this season has brought into focus the limitations of our ship, the Xue Long, and of its ice breaking capacity. As a result, there are already discussions taking place about our need for a new, more powerful ice breaker that can arrive at Zhongshan Station earlier in the season, even with the kind of conditions we encountered this year. And this new ice breaker should also have more laboratory space and research capacity than the Xue Long. The management of China's national budget is decided on a five-year basis, with proposals for the 12th Five Year Plan due in the second half of 2009. What will be CHINARE's new objectives, and what recourses will you be asking for to achieve these objectives? I think one focus will be about sustaining the capacity building that will have been achieved during the IPY. We now need to guarantee new funding to keep this extra capacity operational whilst moving ahead with existing plans such as the continuing renovation of Zhongshan Station in years to come (including a new power plant and accommodation building). The second focus should be on expanding the research programmes for which this extra capacity has been built. In particular, I am thinking of astronomy, ice core drilling, geology, and atmospheric research at Kunlun Station; atmospheric science, geophysics, glaciology, and life sciences at Zhongshan Station; and atmospheric and life sciences at Great Wall Station. At the close of the IPY China programme, after the next Austral Summer (2009-10), we will no longer have a national programme to support PANDA, or our extra capacity. Securing resources as part of China's 12th Five Year Plan is thereby crucial, so we have to work hard to convince the government and public about the importance of our work. And what about the new ice breaker? Will that be included in the 12th Five Year Plan? I hope to get it started in the next five years, yes. Why is it important for China to develop its research effort and infrastructure in Antarctica and especially at Dome A? Is it just about science? 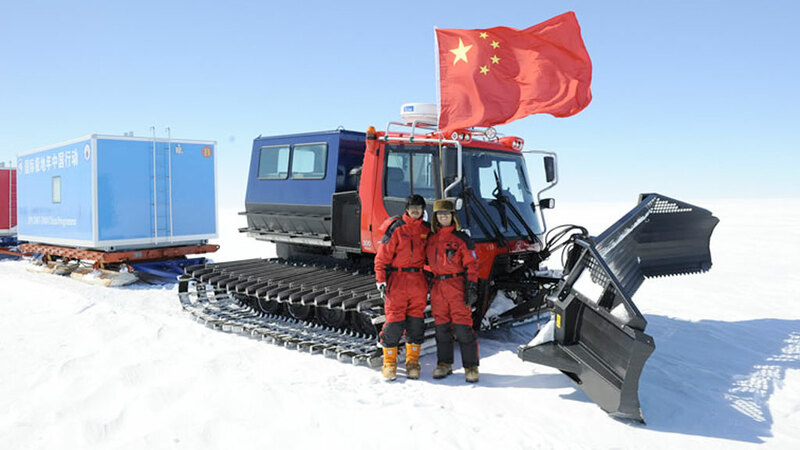 First of all, I should say that building a station at Dome A and drilling a deep ice core there has been a dream for Chinese scientists for a very long time: A dream that can be traced back to the early 1990s. In this perspective, our first inland traverse was completed in 1996, and since then, we have completed six more traverses to the Dome A region. Secondly, China wants to contribute to the IPY legacy, and Kunlun Station is a powerful commitment in that direction. I also believe that Chinese scientists are now ready and want to conduct the highest quality science possible. Dome A will enable us to do this in collaboration with our international partners. Thirdly, with the opening up and development of China, the Chinese people are more interested with what is going outside China. Like in the West, there is a growing motivation, interest, and appetite for understanding our planet. Chinese people want to participate and play their part, and Dome A is a prestigious place that can help us achieve this. You mentioned international partners: Have you already identified these partners, especially in regards to astronomy and the drilling of a deep ice core at Dome A? And if so, where do discussions stand? Last year we organized an international workshop exploring scientific collaboration at Dome A, and in the context of astronomy, we have already started collaboration on the PLATO project with Australia, the United States, and the UK. But for the future development and deployment of larger telescopes at Dome A, this will certainly require Kunlun Station to become operational all year, so there are many big implications that still need to be worked out both nationally and internationally. These are still under discussion. For glaciology and ice coring, scientists in our different glaciology groups are already collaborating with US, French, Japanese and UK laboratories. But here again, whilst the earliest possible start of the 500 metre ice core drilling is next year, it is important to remember that the deep ice core drilling is a ten year programme or more, so things need to evolve at their own pace and in cooperation with both Chinese and international universities and institutions. What I can say however, is that for the deep ice core drilling, our intention is to seek partnerships with foreign partners. The same applies for the analysis of the core or cores which will be stored in the new facility we are building in Shanghai. Will you also be seeking funding from these potential partners, or can China finance the drilling all by itself? It is too early to tell and will depend on the nature of the collaboration, but I think that considering the importance of the project, the Chinese government will very likely provide the necessary support. But of course we have to work very hard and cannot take anything for granted. Finally, do you have plans to make use of renewable energies such as wind and solar power at your different research stations? There is almost no wind at Dome A, so that is not an option, but next year we plan to install a range of different solar panels to test which ones are most suitable for this extreme location. Based on our findings, we then plan to deploy an array of solar panels at Kunlun Station in the following years. For our Zhongshan and Great Wall stations, both located in coastal regions, wind power seems more promising. So we are also carrying out tests with a view to installing more wind turbines in coming years. Dr. Huigen Yang is the Director of the Polar Research Institute of China (PRIC). Prior to his current position, Dr. Yang was Deputy Head of the PRIC.